WARNING: Syria has been engulfed in a civil war since 2011. Many areas continue to see armed conflict. Foreigners are at risk of kidnapping, injury or death. The war has caused total destruction of infrastructure, housing, medical facilities, and power and water utilities in many areas. If you do travel there, see War zone safety for more further info. Syria (الجمهوريّة العربيّة السّوريّة the Syrian Arab Republic) is one of the larger states of the Middle East and has its capital in Damascus. Syria is bordered to the north by Turkey, to the east by Iraq, by Jordan and Israel to the south, and by Lebanon to the south-west. In addition, the country has a short coastline on the east Mediterranean Sea. Syria had a population of 21,906,000 people (UN, 2009 estimate), of which 6 million used to be concentrated in the capital Damascus but currently, more than 3,249,000 (Dec 2014) Syrians live as refugees abroad. 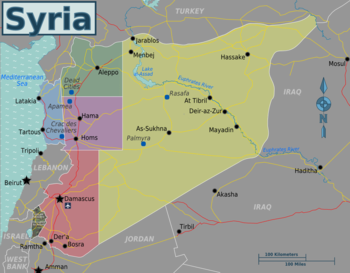 A moderately large country (185,180 sq km or 72,150 sq miles), Syria is situated north within the Middle East region and has land borders with Turkey in the north, with Israel in the south, Lebanon in the west and the south, Jordan in the southwest, and with Iraq in the south-east. The population of Syria is predominately Arab (90%), with large minorities from other ethnic groups: Kurds, Armenians, Circassians and Turks. The official language is Arabic, but other tongues that are occasionally understood include Kurdish, Armenian, Turkish, French and English. The Syrian Republic is officially secular. Nonetheless, it is greatly influenced by the majority religion of Islam (90% of the population, split between 74% Sunni Muslim and 16% other Muslim, Alawites and Druze). There is a large Christian minority that amounts to about 10% of the population. The President of Syria is Bashar al-Assad, who replaced his father Hafez al-Assad soon after his death on 10 June 2000. Having studied to become an opthalmologist (eye doctor) in Damascus and London, Bashar was groomed for the presidency after the 1994 car accident of his elder brother Basil. As a consequence, he joined the army and became colonel in 1999. Bashar's position as head of the Syrian state rests on his presidency of the Baath Party and his command-in-chief of the army. Assad's government and the Baath Party own or control a vast majority of Syria's media. Criticism of the president and his family is not permitted and the press (both foreign and domestic) is heavily censored for material deemed threatening or embarrassing to the government. A brief period of relative press freedom arose after Bashar became president in 2000 and saw the licensing of the first private publications in almost 40 years. A later crackdown, however, imposed a range of restrictions regarding licensing and content. In a more relaxed manner (perhaps owing more to the fact that these matters are largely beyond possible government control), many Syrians have gained access to foreign television broadcasts (usually via satellite) as well as the three state-run networks. In 2002 the government set out conditions for licensing private, commercial FM radio stations, ruling at the same time, however, that radio stations could not broadcast news or political content. Occupied by Israel in 1967 and formally annexed in 1981, the Golan Heights is claimed by Syria. The annexation is not recognised by the United Nations. A small area of land centred on Quneitra was transferred back to Syria in 1974. This deserted town, kept in its ruined state as a monument to the war, can be visited with permission from the Ministry of Interior (open 08:00-14:00, Sunday-Thursday, authorisation requires your passport and takes around 30min). Entry will be refused to citizens of Israel, anyone showing stamps/visas from Israel, and anyone carrying products made in Israel or with Hebrew labelling. Visas  are needed for most individual travelers. These are available in 6-month (single/multiple entry), 3-month (single) and 15 day (land borders only) versions. Citizens of Arab countries do not require visa, except unaccompanied Moroccan women below 40 years old. In addition, citizens of Malaysia, Turkey and Iran do not require visas. Getting visas in advance is expensive and confusing. Americans are required to apply in advance at the Syrian embassy in Washington DC, even if they live elsewhere, and pay US$131. Most other travellers, though, can get them anywhere, a popular choice being Istanbul (Turkey) where they are generally issued within one day for €20 (Canadians) or €30 (EU citizens). A "letter of recommendation" stating that your consulate has "no objection" to your visit to Syria may be required. The visa issued must have two stamps and a signature, otherwise the visa is considered invalid and you will be turned back at the border. It is necessary to keep the blue arrival form as it must be submitted upon departure. Official policy says that, if your country has a Syrian embassy or consulate, you should apply for your visa in advance. Most nationals must apply for a Syrian visa in the country in which they are a citizen. Alternatively a foreign national may apply for a Syrian visa from a Syrian Consulate in a country other than their own if they hold a residency visa valid for at least 6 months for the country in which they are applying. There are very few exceptions to this rule. In practice it is 'no longer possible' (as of June 2016) to obtain a visa on the border for most nationals. Please note that the following below applies to border crossings controlled by the Syrian Government. All land borders from Turkey have been shut down save for official travel and Syrian Citizens, where the Syrian border is controlled by the Free Syrian Army (FSA). Do not buy a bus ticket that will take you all the way across the border. They will always leave you there because it does take 2-10 hours for US citizens and they will not tell you that in advance at the time of purchasing of the bus ticket. Buy a ticket to the border via minibus/shared taxi (servees) then do the same when you get to the other side. US citizens cost U$16, while others are more costly, Japanese are U$12/14, Singaporeans are $33, Australians/New Zealanders are about $100, Swiss are 63 USD. They only take US$ or Euros. You may only receive a 15-day single-entry tourist visa and will have to go through this process if you ever re-enter Syria. When you exit Syria, you will have to buy/pay an exit card for about $12. If going by land, and you are planning to get a visa on the border, bring US Dollars or Syrian Pounds. Foreign currency will not get a good exchange rate and at most crossing there are no facilities for credit/debit cards. Travellers cheques are also not accepted. American citizens need to beware of sanctions on Syria. While travelling and spending money in Syria is permitted, you may not fly with Syrian Arab Airlines, and more importantly, many US banks err on the safe side and ban all business with Syria. Some credit or ATM cards may not work, although many Americans today experience little problems in this regard. Be wary, however, as some travellers have had their bank account access frozen, regardless of whether or not they informed their bank of travel to Syria. Syria has Four international airports: Damascus International Airport (DAM), 35km (22miles) SE of the capital, Aleppo International Airport (ALP) just northeast of Aleppo in the north of the country, Lattakia International Airport (LTK), south of Lattakia, AlQamishli International Airport. As a result of the ongoing civil war, air links to Syria are extremely limited. As a result of sanctions, direct flights between Syria and the EU are banned since July 2012. Russia's Aeroflot followed, terminating its service as a result of persistently low demand. Arab carriers such as Emirates, Royal Jordanian or EgyptAir suspended service in November that year as a result of fighting near the Damascus airport. Currently, the only available air links are from Iran and possibly Algeria. Note that it is dubious whether tourists will be permitted on Iran's flights or whether they are restricted to military personnel only. Even if you overcome the odds and purchase an air ticket, keep in mind that airports can be closed at short notice. Upon arrival, a free entry visa can be delivered to almost all travellers if they are being received by local Travel Agency. Call the Syrian Embassy in your home country for more information. Syria levies a departure tax of 7150 Syrian Pounds (~US$13) at land and sea borders. Since Summer 2009 airport departure tax is included in the ticket price, and airlines will put a manual stamp on your boarding pass. There is no bus service from Turkey as all land crossings have been closed by Turkey (Except for official travel and at times Syrian citizens. You can also travel by bus from Jordan & Lebanon. When travelling from Lebanon, service taxis (taxis that follow a fixed route only, usually from near one bus station to another) are a convenient way to reach Damascus, Homs, Tartus, Aleppo or other Syrian towns. A shared service taxi from Beirut to Damascus will cost about between 700 and 800 Syrian Pounds per person ($17), based on four people sharing the same taxi. If you want a private taxi then you will have to pay for every seat. From Latakia to Beirut a seat in a service will cost 800 Syrian Pounds with around 500 Syrian Pounds being charged from Tartous to Tripoli. In most cases it is necessary to buy a Syrian visa before leaving home, often costing about $130 or less, depending of the country of residency. It's possible, to obtain free entry visa for tourists if being received by a local Travel Agency. It is also possible to arrive by car from Turkey. A private taxi from Gaziantep Airport (Turkey) will cost about $60. Cars can be rented at various Sixt, Budget and Europcar locations. Cham Tours (formerly Hertz) has an office next to the Cham Palace Hotel, which offers competitive rates starting at about USD 50 / day incl. tax, insurance and unlimited kilometres. If you have never driven in Syria before, make sure you take a taxi first in order to get a first-hand idea of what traffic is like. Especially in Damascus and Aleppo, near-constant congestion, a very aggressive driving style, bad roads and highly dubious quality of road signs make driving there an interesting experience. So do be careful. If you have an accident in a rental car, you must obtain a police report, no matter how small the damage or how clear it is who is at fault – otherwise, you will be liable for the damage. Police (road police No:115) probably will only be able to speak Arabic, so try to make other drivers help you and/or call your rental agency. Gas (marked as "Super", red stands) comes at SYP 40 a litre (+10%tax) so it is 44syp, diesel (green stand) at approx. half the price. If you manage to get out of fuel (try to avoid it), which is quite easy wherever eastern of Damascus-Aleppo highway, or mountains western from it; you can manage to find some local able to sell you few litres from canister, but prices may be high (say SYP 70 a litre). Usually gas stations are only in bigger towns and major crossroads in the desert, so try to refuel whenever you can. While travelling by bicycle may not be for everyone, and Syria is by no means a cycle tourist's paradise, there are definite advantages. Syria is a good size for cycling, accommodation is frequent enough that even a budget traveller can get away with "credit card" touring (though in the case of Syria, it might be better to refer to it as fat-wad-of-cash touring). There are sites that one can not get to with public transportation like the Dead Cities and the people are incredibly friendly often inviting a tired cyclist for a break, cup of tea, meal or night's accommodation. The problem of children throwing stones at cyclists or running behind the bicycle begging for candy and pens does not seem to have appeared in Syria. Locals young and old alike will, however, be very curious about your travels and your bicycle and if you stop in a town you can expect a large crowd to gather for friendly banter about where you are from and your trip. Arabic is the official language. It is always a good idea to know some words ("hello", "thank you" etc.). A surprising number of people speak at least (very) rudimentary English. It would however be worth your while to learn basic numbers in Arabic in order to negotiate taxi fares. Personnel working with foreign tourists (like tourist hotels, restaurants, tour guides, etc. ), generally can communicate reasonably well in English. French is also spoken too. Turkish and Kurdish are languages that can also be used in the north. In the north regions under Turkish Army control, there are many people who know Turkish and many workers with government contracts coming from Turkey. In the regions to east of where the Turkish Military is in control, there is a dominate Kurdish population Due to the general lack of ability by the public at large to communicate in English beyond basic phrases, Syria is a great place to force yourself to learn Arabic through immersion, should you wish to improve your Arabic skill. There are many places to see in Damascus: Al Omawi Mosque. In Hama there is the Al Aasi Water Wheels in a river ( نواعير نهر العاصي ). Al Hosn Castle in Homs. It is useful to note in Northern Syria where the Turkish Military has control, the Syrian Pound has fallen out of favor. Most used currencies are the American Dollar and the Turkish Lira. You can still use Syrian Pounds, as well as Euro, and some places British Pounds. In the souks (especially the Souk Al Hamidiya in the Old City of Damascus where you can easily "get lost" for a whole morning or afternoon without getting bored), the best buys are the "nargileh" waterpipes, Koran, beautifully lacquered boxes and chess/draughts sets and (particularly in Aleppo) olive soap and traditional sweets. The quality of handicrafts varies widely so when buying lacquered/inlaid boxes, run your hand over the surface to see that it is smooth, check, in particular, the hinges. In the souq haggling is expected. Bargain ruthlessly. 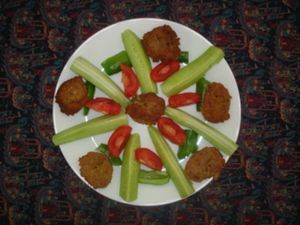 Falafel, deep-fried chickpea patties, are available for 600 to 800 SP. Another popular vegetarian meal is Foul. Don't let the name put you off. It's actually pronounced “fool” and this fava bean paste – topped off with cumin, paprika and olive oil and served with flatbread, fresh mint and onion – is not only tasty but satisfying and filling. Meat wraps such as shawarma cost 800 to 1200 SP. A half-chicken with bread and mayonnaise dip to take away costs 1000 SP. Lunch or dinner in a fair restaurant costs 15000 SP. An expensive restaurant lunch or dinner will run about 40000 SP. Generally you cant drink tap water, its usually unfiltered, but if you're unsure ask the locals first. This water is free compared to bottled water, which comes at anywhere between 150-250 Syrian Pound for 1.5 litres. Fresh fruit juices are available from street stalls in most towns. A large glass of mixed juice (usually banana, orange juice and a few exotic fruits like pomegranate) costs 200-400 SP. Beer is cheap, costing from 350 SP in a shop and anywhere from 500 to 1000 SP in most budget accommodation and local bars for a half litre bottle or can. Syrian wine can be found starting at about 1500 SP and Lebanese and French wines are also available in a higher price bracket, starting at 3500-4000 SP. Syria is becoming a major destination for students of Arabic. There are several institutions in Damascus that teach Arabic. If you entered the country on a tourist visa, don't try to work and earn money. Foreign workers should always get official approval to work. Despite this, many foreign students supplement their income by teaching and many institutes in Damascus will happily hire foreigners and pay them under the table. However, since the 2011 civil war, it is best to not apply for work under any circumstances due to the ongoing conflict. WARNING: Since 2011, Syria has been gripped by a political crisis, which has become a full-scale civil war. Travel here is strongly discouraged by most Western governments. Forces loyal to the Assad government have carried out deadly bombings and attacks on rebels who hide among the civilians. Rebel forces have also carried out indiscriminate attacks on government targets and pro-government civilians. Many foreigners have attempted to enter Syria in order to join the opposition forces (namely jihadist groups) against the government, even though doing so is practically suicidal. If you are in Syria and cannot leave, try to avoid areas subject to fighting, including Aleppo, Idlib and several other areas. Syria is emphatically not safe for tourists. Several foreign hostages have been killed in Syria. In addition, homosexuality is illegal in Syria. Businesses are not LGBT friendly, and homosexual acts can be punished by long prison terms. Health care in Syria is well below Western standards, and basic medication is not always available. Local pharmacies are well stocked with treatments for most common ailments such as stomach bugs and traveller's diarrhoea. Pharmacists often speak a little bit of English. You can ask your hotel to call a doctor if necessary and a visit to your hotel room will cost about 700-1000 SP as of November 2007. If you have a treatment, take it with you. Don't expect to find all medicines in Syria. If you have to buy something from a pharmacy, ask for a "foreign" EU or US brand. You will have to pay a premium for that, but at least you will increase the chances to have an actual medicine. Some products come from uncertain origin and are ineffective, according to certain local pharmacists. Male and female visitors can generally wear whatever attire they would normally wear in their home countries. Contrary to what some Westerners may believe, it is possible for women to wear T-shirts and it is not necessary to wear long-sleeved tops unless visiting a religious site. Head covers are recommended when visiting Muslim religious sites, as well as in Christian Orthodox ones. Dress as you would normally dress in the West to visit Christian religious sites, avoid wearing shorts at churches. Many local women dress in Western attire, especially in Christian neighbourhoods. Shorts are common for men and women alike. Be mindful of your environment, outside of areas frequented by tourists it is wise to dress in more modest apparel. Women who wish to attract less attention should wear shirts that reach the elbow, and have no revealing cleavage. Regular t-shirts and jeans are completely acceptable attire throughout all of Damascus. If you are of European ancestry most Syrians assume that you are a practising Christian. Most Syrians will also be puzzled by a suggestion that you are an atheist, due to the strong influence religion has in Syrian social and cultural life. However, a considerable percentage of the Syrians are not practising Christians or Muslims themselves and do not hide their lack of religious affiliation as Syria is officially a staunchly secular country. The coastal areas are much more progressive when dealing with religion and the same applies to areas of Damascus most frequented by Western tourists such as Bab Touma, the Christian Quarter. The further you travel east, the more conservative people are. In order to avoid any protracted philosophical discussions, it is best to avoid identifying as an atheist or non practising Christian. Syria views Israel's occupation of the Golan Heights to be illegal. Syrians have negative views of Israel due to this occupation (among numerous other reasons). There is still a small Syrian Jewish community living in Damascus, and they are subject to fierce repression and intimidation by the government. Unless you have a heart for prolonged discussions, avoid any debate about Israel. It is Extremely Dangerous to make critical remarks about the Assad government. Dissidents have been brutally tortured and killed for criticising the government. However if in a region controlled by the Free Syrian Army, or the Islamic State, Pro-Assad remarks may lead to your execution. Therefore, it is unwise to make any remarks about President Assad, the government and the Ba'ath Party and such comments may cause alarm. Syria is not a democracy and critical comments regarding the Syrian government are to be avoided. Syria has easy and cheap internet access. Internet is very common around the cities at internet cafes. Facebook and YouTube have recently been unblocked but there are still some websites blocked such as certain news sites. The cafes are very friendly but in order to avoid being price gouged it is best to ask a local how much the internet costs per an hour before agreeing to sit down. It is usually 500 S.P per hour (1$ US), but can be anywhere up to 1000 S.P per hour (2$ US). It is best to avoid political debates regarding the Syrian government, or reading Israeli newspapers or websites online. This page was last edited on 24 January 2019, at 12:51.